This post takes a look at how and where end-user quality assessment fits into the software development practice of continuous integration and considers the advantages of solutions that interact with web, Windows and mobile applications. Looking back over the past year, ‘continuous integration’ or ‘CI’ is one buzzword that gained significant momentum in 2018 (like all things ‘agile’ earlier on). A recent example of this trend is the acquisition by Microsoft of the CI repository tool GitHub for more than 7 billion US$ in 2018. The cyclical, efficiency-oriented practice of continuous integration has become the thing to strive in software development. In theory, CI saves developers time and increases the reliability of the software thanks to regular integration of code changes and testing. CI needs to ensure software reliability by bringing quality checks into the development process earlier on and more frequently than in traditional development cycles. For its part, end-user APM (application performance management), with its focus on quality and production monitoring, continuously strives to maintain and improve the quality of experience delivered to users of applications. In general, APM tools are designed to monitor the performance of an application in production from the end user’s point of view. In terms of a basic CI workflow diagram, APM tools can also come into play at the crucial stage of integration, for regression testing in a CI environment, as well as in production, to test the software’s behavior in real-life situations. But how do tools designed to test end-user quality of experience work upstream, in a context of delivery automation? How do they save time and effort by streamlining script maintenance? Keep reading…! Like CI, Selenium was an increasingly popular topic in 2018. Selenium IDE was specifically designed for the needs of continuous integration. It is an environment for testing, and is implemented as a browser extension. Scripts recorded in Selenese can perform actions in a browser and retrieve data from pages. Even better: this CI-oriented environment fits with end-user application performance monitoring. Very usefully, Selenium supports test scripts which are written in other languages, provided they call methods in the Selenium Client API. For this reason, integrating Selenium is an advantage for end-user experience synthetic monitoring tools. Such tools can then run scripts for both regression testing and production monitoring, thereby reducing the scripting effort by half. This is how existing end-user monitoring tools, if they are open to Selenium, can be used for testing in the context of continuous integration. 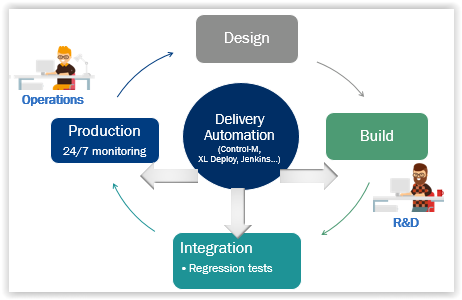 These tools can focus their capabilities on quality assurance within the delivery automation cycle. Ask our specialists about how application performance tools can fit into your continuous integration process. They are here to advise and help with your specific needs.